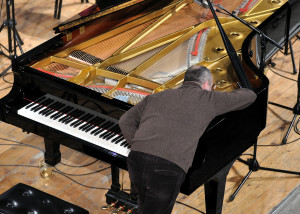 Piano tuning is both an art and a science. Every piano has its own unique characteristics and no two tunings will ever be exactly the same. My goal as a tuner of over 38 years is to draw out the best possible sound of each piano I work on. Here are some of the most frequently asked piano tuning questions. Pianos in California are tuned an average of once-a-year. This is because the climate is less severe than in other parts of the county. On the East coast where I grew up, the pianos had to be tuned twice each year to account for the seasonal humidity variations. What does piano tuning cost? Piano tuning can range in price from $150 to over $250 depending on the time it takes. If a piano hasn’t been tuned in many years, it will usually require a “pitch raise” that will add time to the process. Some very old pianos have rusty strings which break making it necessary to re-string the piano with new wire (see piano restoration). And there are antique pianos called birdcage uprights and square grands that cannot be tuned at all due to their poor construction. Voicing is what I call piano acupuncture. It is adjusting the “voice” of the piano which is largely determined by the hardness of the hammers hitting the strings. We use a sewing needle attached to the handle of the voicing tool to poke the hammers and produce the optimum tone. Perhaps even more than tuning, voicing affects how the piano can and should sound. Ear (Aural) tuners VS Electronic tuners…which is better? The best piano tuners are always aural tuners first. This is because, in order to properly tune a piano, one must listen to the whole sound, not just one note at a time. When tuners are proficient in aural tuning, then they may utilize an electronic device as a “third ear” in some difficult situations like a noisy room or a concert stage. In my experience, I have only met a select few technicians who use electronic tuners in the way I have described. Does a piano need to be tuned even if it hasn’t been played very often? The answer is yes because the process of piano tuning helps to “seat” the strings at their contact points keeping the piano from developing buzzes and other problems later on. Note: Piano tuning is the art of arranging approximately 285 piano strings to sound pleasing in any of the 12 musical key signatures. Unlike the days of Bach and Beethoven where instruments were tuned to specific keys like C or G, modern “equal temperment” tuning makes it possible to play in all keys. This is because the intervals are slightly altered and made to be equi-distant from each other.